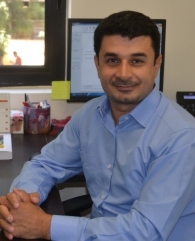 Abbas Tarhini is an Assistant Professor of Information Technology. He holds a PhD in information systems from University of Reims, France, an M.S. and B.S. degrees in computer science from the Lebanese American University. His research has been published in recognized journals including IEEE Transactions on Intelligent Systems, Journal of Business Research and more. Dr. Tarhini is a member of the Association for Information Systems (AIS) and an honorable member of the Beta Gamma Sigma honor society. He is the president-elect of the Middle East and North Africa association for information systems (MENA-AIS)- the AIS chapter in the MENA region, and the VP for research at the Lebanese Association for Information Systems- AIS Lebanon chapter and the association of Information and Communication Technologies in Organizations and Society (ICTO), France. He is the treasurer of the Arab Computing Society (ACS), Lebanon Chapter. He is actively involved in social and environmental initiatives through his membership in several forums and associations, namely the Academic Youth Association-Abba, which he founded in the year 2000. Yunis, M., Tarhini, A., & Kassar, A. (2018). The role of ICT and innovation in enhancing organizational performance: The catalysing effect of corporate entrepreneurship. Journal of Business Research, 88, 344-356. Tarhini, A., Yunis, M., & El-Kassar, A. N. (2018). Innovative sustainable methodology for managing in-house software development in SMEs. Benchmarking: An International Journal, 25(3), 1085-1103. Tarhini, A., Yunis, M., El Kassar, A. (2017). Innovative Sustainable Methodology for managing in-house Software Development in SMEs”, Benchmarking: An International Journal. Yunis, M., Tarhini, A., El Kassar, A. (2017). The role of ICT and innovation in enhancing organizational performance: The catalysing effect of corporate entrepreneurship. Journal of Business Research. Tarhini, A., Yunis. M. & Chamseddine, M. (2016). Natural Optimization Algorithms for the Cross-Dock Door Assignment Problem. Journal of IEEE Transactions on Intelligent Transportation Systems, 17(8), 2324 - 2333. Yunis, M., El Kassar, A., Tarhini, A. (2017). Impact of ICT-based Innovations on Organizational Performance: The Role of Corporate Entrepreneurship. Journal of Enterprise Information Management, an Emerald Publication. Fouchal, H., Roulet, A. & Tarhini, A. (2010). Robustness testing of composed real-time systems. Journal of Computational Methods in Sciences and Engineering, 10(2), 135-148. Tarhini, A. (2016, July 3-6). Genetic Selective Hyper-Heuristic for the Vehicle Routing Problem with Pickup Delivery. Paper presented at the 28th European Conference on Operational Research (EURO 2016), Poznan, Poland. Tarhini, A., Tarhini, J. Tarhini, A.M. (2016, June 3-4). Information Technology Adoption and Implementation in Higher Education: evidence from a case study in Lebanon. Paper presented at the Lebanese Conference on Information Systems (LCIS 2016), Beirut, Lebanon. Yunis, M., Tarhini, A., El Kassar, A., (2016, March 3-4). Corporate entrepreneurship: a mediator in the ICT-organizational performance relationship. Paper presented at the International Conference on Information and Communication Technologies in Organizations and Society (ICTO 2016). (Also published in “The social relevance of the Organization of Information Systems and ICT”. The book will be published as volume of the Springer series: Lecture Notes in Information Systems and Organization (LNISO). Tarhini, A. (2015). Modified Clarke Wright Algorithm for Solving the Realistic Vehicle Routing Problem. Presented at the 3rd IEEE International Conference on Technological Advances in Electrical, Electronics and Computer Engineering (TAEECE2015), Lebanon. Tarhini, A. (2014). Scatter Search Algorithm for the Cross-Dock Door Assignment Problem. Paper presented at the 17th IEEE Mediterranean Electrotechnical Conference. (MELECON 2104) Beirut, Lebanon. Tarhini, A. (2013). Optimization Metaheuristic for Software Testing. Presented at the IEEE Conference on Evolutionary and Adaptive Intelligent Systems. (IEEE EVOLVE 2012). Berline Heidelberg: Springer-Verlag. Fouchal, H., Rollet, A. & Tarhini, A.(2009). Robustness Testing on Composed Timed Systems. International Conference on Software Engineering and Data Engineering (SEDE), ISCA, Las Vegas, USA. Tarhini, A., Ismail, Z. & Mansour, N. (2008). Regression Testing Technique for Web Applications. Presented at the International Conference on Advanced Computer Theory and Engineering, ICACTE,Thailand.